A ‘Door’ has a literal meaning of a moving mechanism used to block off, and allow an entrance to an enclosed space such as a building, room or vehicle. 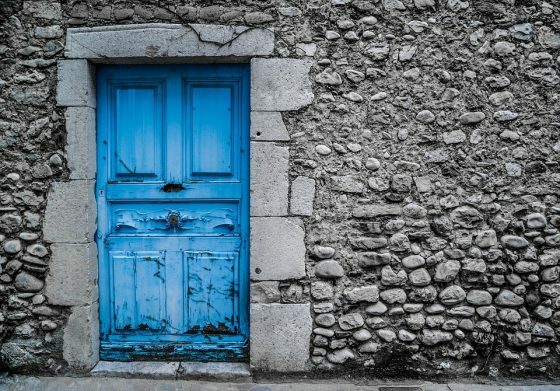 A door, as simple it sounds, can have different meanings and interpretations. Some people may think of new opportunities while some might think of dead ends. For a group discussion, some aspects of the term ‘Door’ are listed below. Dutch Door / half Door : Also known as a stable door, it is divided half horizontally. Traditionally the top half can be opened to feed a horse or other animals. The bottom half remains closed to keep the animal inside. Saloon Door / café Door : This kind of doors are a pair of lightweight swing doors often found in public bars in the American west. These doors use bidirectional hinges with springs set in them. Saloon doors from the knee level to the chest level are called batwing doors. Gibb Door / Blind door : This type of door has no visible trim or operable components. They are visually a part of the wall. This door is mainly used as a disguise. Flush Door : This is a completely smooth door of plywood or MDF. A light timber frame is fixed below it and the hollow parts are often filled with a cardboard core material. Wicket Door : It is a small pedestrian door which is built in a larger door. It allows access to people without opening the larger door. Such doors are found on the ceremonial door of a cathedral, in large vehicle doors of a garage etc. Bifold door : It is a door with several sections folding in pairs. Wood, metal or glass are its common materials. Bifolds are most commonly made for closets, but may also be used as units between rooms. Trapdoor : This is a horizontal door oriented in a ceiling or a floor. The door is often accessed via a ladder. Sun Microsystems developed Doors as a core part of the Spring operating system. Then Solaris version 2.5 added it as an undocumented internal interface. They became a documented feature in Solaris 2.6. Recent versions of Solaris use doors in many places, including nscd (the name service cache daemon) and syslog. A BBS door is a mechanism to execute and communicate with an external program on a bulletin board system. Doors are the most common way to add games, utilities, and other extensions to BBS software. A major use of door is for door games. These are computer games played on BSS. Strategic games like TradeWars 2002, Space Dynasty, Solar Realms Elite, Food Fight etc., fall under door games. Also, non entertainment applications of door are permitting users to time-shift their rationed BBS use, time bank, acting as a front-end to themed databases on astrology, numerology, recipes, weather predictions etc. DOOR (Database of Origin and Registration), is also the European database that includes product names for foodstuffs registered as PDO, PGI or TSG. Door County is a county in the U.S. state of Wisconsin. This is also a popular vacation and tourist destination for the people of Illinois and Wisconsin. The Door Peninsula is a peninsula also in eastern Wisconsin. It separates the southern part of the Green Bay from Lake Michigan. A door can be symbolic of a new beginning, or a way to some desired destination etc. Many music records have the term ‘Door’ in them. Some such albums are ‘Doors’ by saxophonist Eric Kloss in 1972, ‘Door’ by Every Little Thing in 2008 and a single ‘A Door’ from Aaron Tippin’s album ‘Greatest Hits… and Then Some’ in 1997. Just like music, some films and books also have the term of door included in the titles. The film ‘The Door’ is about a rock band, Door is also a character in the Neil Gaiman novel and television series Neverwhere and The Wittenburg Door is a humor and satire magazine. Furthermore in literature, ‘The Door’ is a 1987 novel by Magda Szabó. ‘The Door’ is also a poetry collection of Margaret Atwood in 2007. Miroslav Holub in his poem, E. B. White in his short story and Mary Roberts Rinehart in her 1930 novel used similar titles. Feel free to comment your opinions in the comments section below. According to me Door means to enter any covered place surrounding wall such as building ,enclosure and car . Door another meaning is the gateway to reach the desired destination. Somebody think Door means end.